Dorman's Auto Trans Oil Cooler is quality-engineered to cool automatic transmission fluid, prolonging its life. 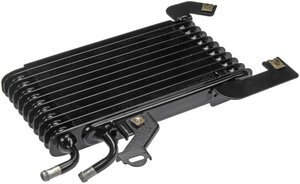 The Auto Trans Oil Cooler consequently helps prevent transmission fluid leaks and overheating, protecting the transmission from possible costly damage. Recommended for replacement when replacing the transmission. Dorman also offers an Auto Trans Oil Cooler Hose Assembly, sold separately.